Replace the standard 'Make Enquiry' button with 'Book Viewing', 'Book Valuation' and 'Make Offer' functionality from OneDome. Once installed and activated you’ll have the ability to remove the default ‘Make Enquiry’ button that comes with Property Hive and, instead, display ‘Book Viewing’, ‘Book Valuation’ and ‘Make Offer’ buttons. Once clicked they’ll then open the relevant form provided by OneDome meaning anything submitted will appear in your OneDome account right away. 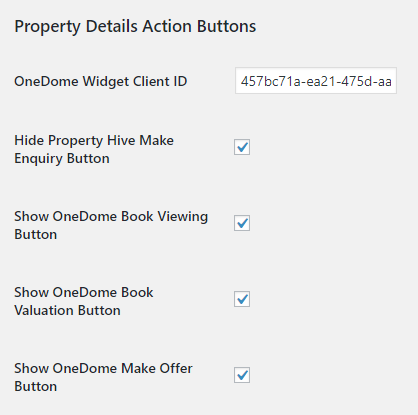 From within the settings of the OneDome add on you can choose which actions are shown or hidden on the property details page.